I’ve been reading aloud William Stearns Davis’ A Day in Old Rome (Allyn and Bacon, 1925, 1966) at the Latin table with my boys on Mondays. 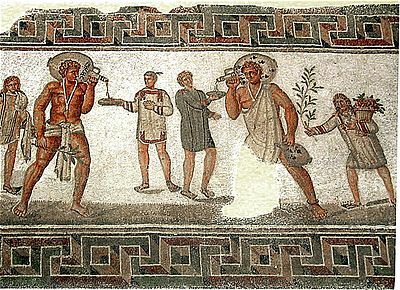 We recently covered a section on slavery in ancient Rome. III. Speaking tools—slaves useful as farm hands. He notes that under the emperor Hadrian an edict was issued “that a slave could not be killed outright by his master without some kind of consent by a magistrate,” a law which made “every owner of human bipeds” grumble. The edict, however, provided slaves “little practical help,” considering that a master could still order “a punishment so brutal that death is certain, and if he should murder a servant, slave witnesses can given no valid testimony, and almost no citizen will turn traitor to his class and prosecute. Half of Rome, therefore, continues in the absolute power and possession of the other half” (125). Davis describes an imagined upper-class household (of the Calvus family). He notes that while the master and mistress might act kindly toward a few personal slaves, they ordinarily treat their servants “absolutely impersonally.” He says: “their presence is taken for granted like articles of furniture, and their personal problems are ignored” (132). And he adds that it is considered “good breeding to speak to ordinary slaves as seldom and then as curtly as possible, just as one should not waste words addressing a yoke of oxen” (133). Reading this I thought of how strange the early churches must have appeared in such an environment. Consider the household codes of Paul in Ephesians 6:5-9 and Colossians 3:22—4:1, which assumes slaves and masters worship Christ together. Not only does Paul exhort slaves to “obey in all things your masters according to the flesh” but also masters to give to their servants “what is just and equal; knowing that ye have a Master in heaven” (Col 3:22; 4:1). What of Paul’s admonition to Christians slaves to remember that whatever their outward estate they are “the Lord’s freeman” (1 Cor 7:22)? Or of his meditation in Galatians 3:28 that in Christ “there is neither bond nor free”? Or of his reminder to Philemon that the newly converted runaway slave Onesimus returned to him “not now as a servant, but above a servant, a brother beloved” (Philemon 1:16)? It is no wonder then in Acts when Luke records an occasion when a Christian named Jason and other brethren were brought before the city fathers in Thessalonika, and their accusers cried out, “These that have turned the world upside down are come hither also” (Acts 17:6). What is your take on evangelicals (i.e. PCA, etc.) apologizing for slavery? Anon, thanks for the comment. I'm not sure what to say about this. On one hand it seems like political "virtue signaling" on the part of a denomination (and makes me glad I am no longer affiliated with one--former SBC). Why not simply preach and live out the gospel in our present circumstances?